The crying little bundle in my arms was making Artie anxious. “It’s OK, buddy,” I said, as he frantically whimpered and jumped up to see what it was. “Down,” I scolded, gently, but firmly. He followed me throughout the house, stopping when I stopped and rearing up on his little hind legs to try and catch a glimpse. Clyde, though nearly deaf, was curious as to what I was holding and stayed close behind. “Try sitting on the couch,” Jonathan said. I settled into the sofa and immediately, both dogs put their paws up on it, begging to be let up and sneak a peek at this mysterious little thing I was carrying around and handling with such care. “Be sweet,” we said. 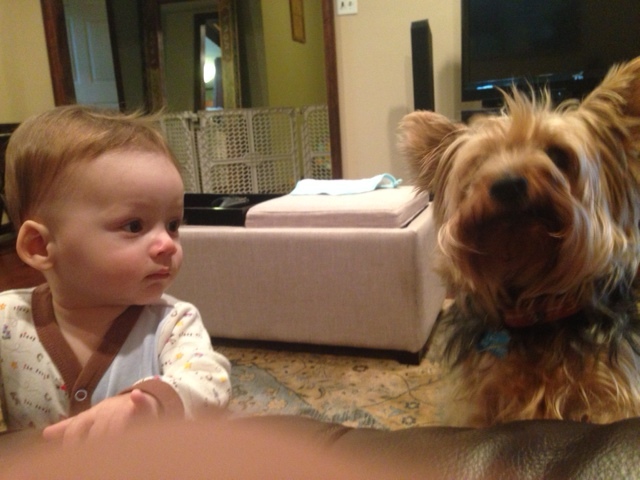 “This is your baby brother,” we informed them. Artie was the one we were worried about. We were certain that Clyde would, for the most part, ignore C.J. But Artie? There was no telling how his curiosity and jealousy would manifest themselves. I turned off the crying baby app, unwrapped the bundle and removed the stuffed lion from inside the blue blanket, setting it down on the coffee table. “Don’t let them see that it’s a stuffed animal,” Jonathan scolded, grabbing the lion and hiding it. “They don’t know the difference,” I said, 30-something weeks pregnant and exhausted. “Of course they do,” he said. “They’ve seen a stuffed animal before,” he said, pointing at their stuffed squeaking duck on the living room floor. Oh, right. Guess he had a point. If you’re wondering what the meaning of this absurdity is, let me enlighten you. This was our carefully concocted strategy for getting our beloved furry children used to A) The sound and presence of a crying baby, and B) The loss of our undivided attention. We were determined to make this an easy, painless transition for them. You see, I used to be obsessed with my dogs. Like really obsessed with them. When we left them behind for vacations, I’d request photo updates from the sitter several times a day and leave behind typed, detailed notes with emergency phone numbers and instructions to fill their water bowl with filtered water and ice cubes. I was head over heels for Artie. Every night, we cuddled on the couch and stared deeply into each other’s eyes. True story. It creeped Jonathan out. On the way home, Jonathan would tell me that I should probably stop comparing our dogs to other people’s kids. “Whatever, they ARE our kids,” I’d say. We even had little steps leading up to our bed. People warned us things would change when the baby came. “No way,” we thought. How could it? No one loved their dogs more than we did. Yeah. I’d say things have changed, alright. It sort of happens without you even realizing it. This tiny human demands your body and your attention 24/7 and you don’t even realize there’s a sweet little Yorkie begging for your attention, or a sleepy little peekapoo who’s too old and grumpy to ask, but would love a pat on the head. When I was on maternity leave, there were days I forgot the dogs even existed unless they barked, in which case I became infuriated. There just didn’t seem to be enough energy or love inside me for all of them. Thank God Jonathan still loved them. And fed them. And took them outside. Now that C.J. is 9 months old, we’ve come out of the fog a bit, and I make more of an effort to show both dogs a little love each night. But every now and then, there are moments when we can’t believe how things have changed. Just the other night, Jonathan awoke to Clyde whimpering, laying beside his food bowl. Turned out, we hadn’t filled their food bowls in about 24 hours. I thought he might cry from the guilt. Clyde was his baby, long before I even came along. Things are slowly working toward Back To Normal. Artie and Clyde are getting used to C.J. We think they may even be starting to love him (either that, or they’re tasting him to see if he would make a good meal). We hope that soon, when C.J. is running around, playing with them, his unconditional love and energy will make up for the changes they’ve experienced this past year. That they’ll grow to see him as part of our family, rather than a disruption to it. This entry was posted in Life Before Baby, Uncategorized and tagged family, Home, new mom, parenting, Pets, Pets and Babies, Pets and Kids on March 28, 2014 by eholmes1004.